Perhaps there should be a tournament with this cards at next Revision?! And yes Smash isn't exactly a n00b musician unless he has already forgotten everything! 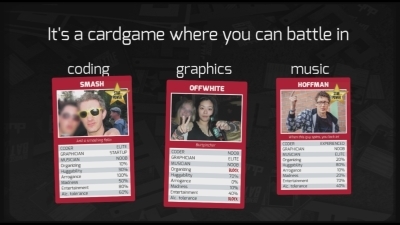 Would be curious to see the whole cards deck, even at rather low res. Epic battle with epic cards! Is it still possible to buy one set of this cards ? First of all, for those who doesn't know yet. Farfar came up with the idea quite a while ago and we remembered it 1 month before Revision. We therefore haven't cleared with anyone about being included on a card or using their photo. Please do read our website to know more. At the moment we have about 20 decks left, including our own copies, these won't be reserved to anyone before we figure out what to do with them. We are of course interested in making more decks, but these aren't cheap to make, so if anyone have any connections, let us know. For these we paid €810 + VAT for 200 decks. Xtrium, Lycan, Vickey, Cheesy, Puryx, Lug00ber and me. (Can't remember if Farfar and Mumboz was there as well) .. it ended without a winner after Puryx and lug00ber played for 3-4 hours without finding a winner, lug00ber were at one point down to one card though, but clawed his way back! Reminds me of Slengpung Playing Cards. Nice. Original and Fun. Can I buy a deck Someway still? page created in 0.025331 seconds with 15 queries.